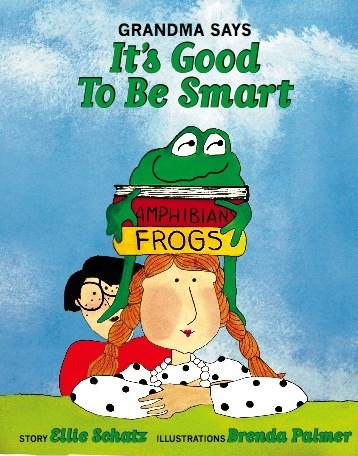 I dreamed of influencing new generations of motivated learners when I wrote “Grandma Says It’s Good to Be Smart.” At book signings as well as readings like those with my grandson’s preschool class, I realize that is beginning to happen. This little girl epitomizes what the book is about. She is joyous; she breathes enthusiasm for learning. When I first saw her, her eyes were sparkling with awe as she gazed at all the mechanical devices and aerial fantasies that decorate Ella’s Deli on East Washington Avenue in Madison. Her mother tells me she was excited to meet a real author AND to have me write her name and my name in her own book. This little girl, and my grandson and his friend as I read to them in Lafayette, Colorado two weeks ago, demonstrate the wonders of early learning. Their curiosity, motivation and awe – for books, the outdoors, meeting people, and exploring the world – delight me. This entry was posted in Awesome children, Children's Books, Creative Kids, Cumulative advantage, Early Learning, Excellence in education, Gifted and Talented Children, Grandma Says It's Good to Be Smart, Growing up smart, It's Good to Be Smart, Modeling a love of reading, Passion in teaching and learning, Picture books, Smart is cool, The chance to learn, Young Children and tagged academically minded, ages 0-7, be smart, caring about ideas, children's picture books, encouraging creativity, grandparent alert, learning is fun, learning through exploration, learning to read, parent alert, pre-k to 2nd grade learners, raising smart children, self-confidence comes with accomplishment, whimsical pictures attract children. Bookmark the permalink. What a joy to see the excitment in my Great nieces eyes! I live a distance from my niece and her family and we talk often. To get children excited about books and reading is something that has missed a generation (too much i-pods, texting, and computer games) who don’t have the patience to read because they rely on their computers/phones for immediate gratification! I love to read and find that children who are read to on a frequent basis – become readers themselves. Thank you for getting our children excited and feel the wonder of reading. Leslie, I have always been fascinated by the depth of wonderment, sensitivity, understanding, and intelligence that can be seen in a child’s eyes. It is a shame when that potential is turned off by society. It was a pleasure to meet your niece and her beautiful child, who is so smart and no doubt will grow up smart!